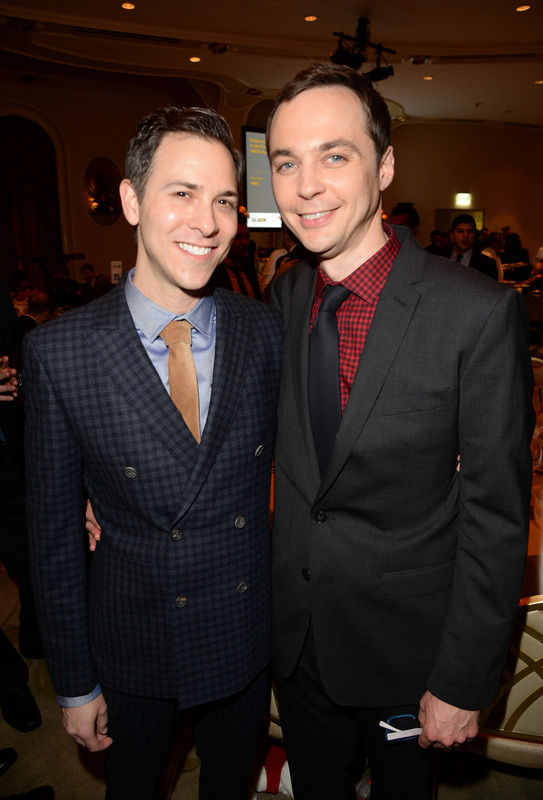 The National Enquirer gave everyone a big “bazinga!” so to speak, when the controversial publication recently reported that The Big Bang Theory star Jim Parsons and his boyfriend Todd Spiewak were engaged. Well, Dr. Sheldon Cooper had to set their facts straight, and the actor took to Instagram (which is the equivalent of making an official press statement these days) to correct the rumor that his increased Big Bang Theory paycheck meant that he was ready to settle down. He posted a photo of him and Spiewak, telling his followers, "Me and Todd in 2003. Still very happy today… And NOT engaged! #justFYI #NationalEnquirerMakesS—tUp #duh." The pair have been together for 12 years, and despite Ellen DeGeneres’ funny and pressuring attempts to get them to say "I do" when she interviewed Parsons on her show, it doesn’t look like a marriage will happen soon. "I don’t know. You get so used to your life as it is," Parsons explained to DeGeneres. "I'm not saying [Todd's] been discouraging it. I feel like I haven’t been enthusiastic enough about it, and I feel like I am a 'loser' for the cause," he said with a mocking shrug. Even if the saying goes "if you like it then you should’ve put a ring on it," Parsons and Spiewak are doing something right since they’ve been together for over a decade. Here are just a few facts about Parson's guy that show us they're good for each other with or without marriage on the horizon. Spiewak has a BFA in Graphic Design from Boston University and worked for campaigns for American Express, Barnes & Noble, and The New York Times. Spiewak and Parson created the production company Wonderful Productions, where Spiewak scouts homes for TV, film, and theater projects. Sheldon might have a thing for cats, but in real life, Parsons and Spiewak live in Los Angeles with their two pups, Otis and Rufus. I'm kidding. Spiewak and Parsons are just one of those regular — and according to them — boring couples. During a rather moving speech where Parson and Spiewak were given the GLSEN's Inspiration Award, Parsons said that their love was never an act of activism. "Rather simply, it's an act of love... Coffee in the morning, going to work, washing clothes, taking the dogs [out] — a regular life, boring love." During Parson's Emmy 2013 speech for his role as Sheldon, the actor finished thanking everyone by saying, "To my favorite person on the planet, Todd Spiewak." Now, Dr. Sheldon Cooper would tell you that finding the single person you can match with in this world, would mean drawing from 7.046 billion people and growing. The odds of finding your that strong connection is highly improbable, impossible almost, but I guess judging from Parsons and Spiewak, it doesn't seem unlikely. Marriage might not be coming soon, but like Parson said on Ellen, they're just good being themselves, as is.